Honor a family member, friend, physician, or caregiver with a lasting tribute that also fuels groundbreaking cancer research and patient care. 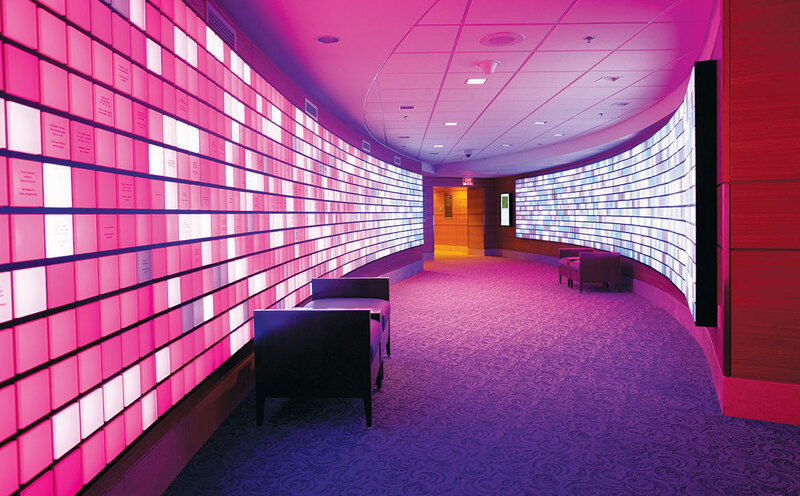 The Gene Display, located in the Robert J. Tomsich Family Gallery in the Yawkey Center for Cancer Care, is a visual and dynamic representation of the real genetic information that leads to lifesaving cancer treatments. Make your mark on cancer with a personal inscription on a four-inch square gene which provides you with a beautiful and lasting naming opportunity at Dana-Farber. Genes can be named individually or as a group with a gift of $5,000, payable over one or two years. The display is a larger-than-life visualization of a microarray, the technology that our researchers use to survey the behavior of genes in a tumor cell. Scientists use this information to classify tumors according to their unique genetic signatures, allowing for more accurate diagnoses and, ultimately, more individual and targeted therapies for each patient. Show your support for Dana-Farber Cancer Institute’s mission by naming a gene with a personal message. Your gift will be directed to the Presidential Initiatives Fund, which supports the most promising new research initiatives and enhances our total patient care. Please use lines 1 – 3 to indicate your personalized message. Use lines 4 and 5 to indicate donor name (20 character limit per line, including spaces). Contact Annual Giving Staff at 617-582-8830 or Gene_Display@dfci.harvard.edu.